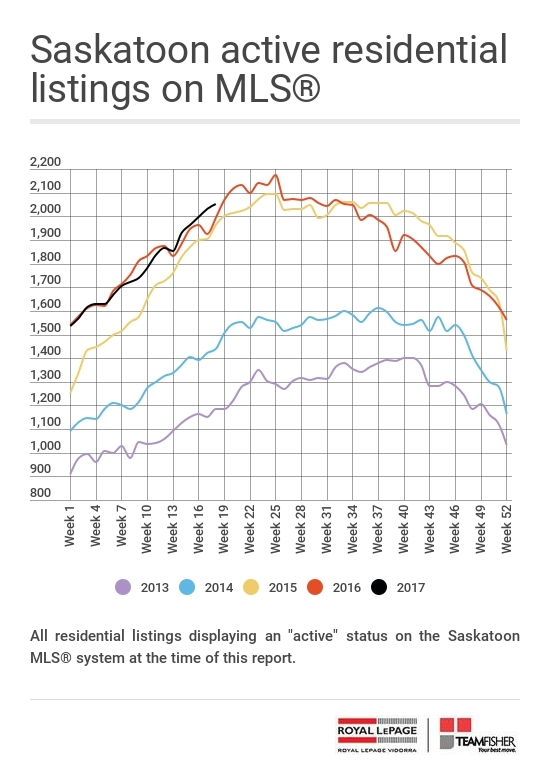 Coming off of three very strong weeks, Saskatoon homes sales slipped lower on both a weekly and an annual basis. Local real estate agents reported 86 firm residential transactions to the Saskatoon multiple listing service®, well down from the 99 deals that were recorded last week. We finish the period with four fewer sales than we saw during the week last year. Meanwhile, the number of new listings added to the MLS® also slipped lower. A total of 203 residential properties were entered into the system, down from 221 last week, but up from 190 of the same period of 2016. MLS® inventory continued to move higher, this week reaching 2174 listings, which is just one listing shy of last year’s peak number. In 2016, total active listings reached their high point for the year around the end of June. That’s about the time when MLS® inventory reaches its highest level most years. If this year follows typical patterns we should top out around 2200-2250 active listings before the inventory starts a slow but steady decline through the balance of the year. Today we have 1195 single-family homes for sale in Saskatoon, up 34 units from this time last year. Condo inventory is at 823 for an annual increase of 30. A strong showing of entry level buyers (13 sales under $200,000) ushered the weekly median price lower to $330,250 while an absence of sales above the $700,000 mark (and only five deals above 500K) brought the average sale price to one of its lowest levels this year. It closed the week at $326,848. After growing by more than $20,000 over five weeks the six-week average price finally took a downward turn as it slipped from $364,096 last week to $357,806, however, it still managed to record a seventeen thousand dollar increase when compared to closing numbers from the same week last year. The four-week median price also went down falling from $348,000 last week to $345,000. That number is also up from a year ago, but by less than nine thousand dollars. Three lucky sellers closed a sale for more than their asking price picking up an average bonus of $2,900. Six more wrapped up a contract at their asking price. The remaining 77 transactions recorded a sale price that was below list by an average of $10,568. The Saskatoon real estate market recorded its biggest sales week this year as the number of firm residential trades hit 99, up by nine when compared to the previous week and beating sales for the same week last year by 17 homes. This was the third consecutive week in which sales were up on an annual basis. The puts us at 280 unit sales for May, up from 234 at the same time in May of 2016. Year-to-date, a total of 1327 Saskatoon homes have been sold, just shy of the 1336 units that had sold by May 19, 2016. New listings continued to come on strong as Saskatoon real estate agents added 221 new listings to the multiple listing service®, up just three compared to the previous week, and down by three from the same period last year. The number of local homes available to buyers through the MLS® system grew by 20 on both a weekly and an annual basis to reach 2135. This is the fourth week in a row that saw some moderation to the year-over-year increases in inventory levels. Today, we have 1169 single-family homes for sale within the city limits, up 21 from a year earlier. The number of condos for sale has grown to 808 for an annual increase of 18. On the whole, sales and listings metrics look fairly similar to last year. 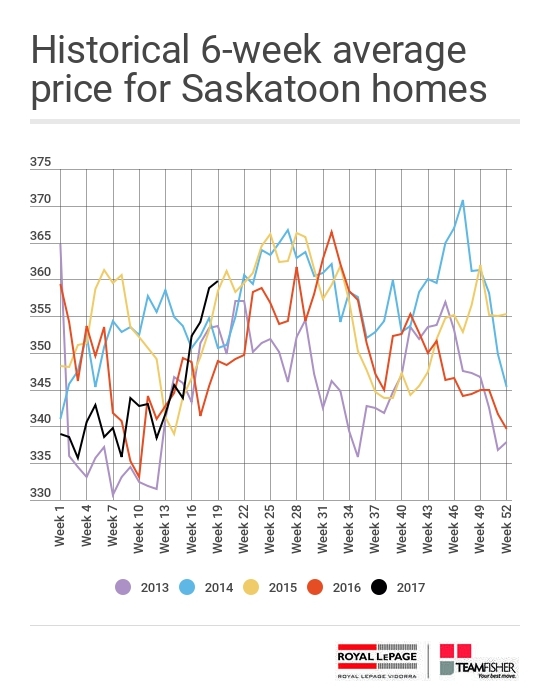 A more typical balance of sales at the upper and lower end of the Saskatoon real estate market brought the weekly median price down from some lofty levels. It slipped lower by 25K this week to $345,000. The weekly average price had stronger staying power and slipped just $500 from a week earlier to $365,010. The six-week average price continued to make gains for the fifth consecutive week. It reached $364,096 which is its highest level this year, and higher than its been during this particular week for the past five years (for the fourth consecutive week). It’s higher than it was a year ago by sixteen thousand dollars. 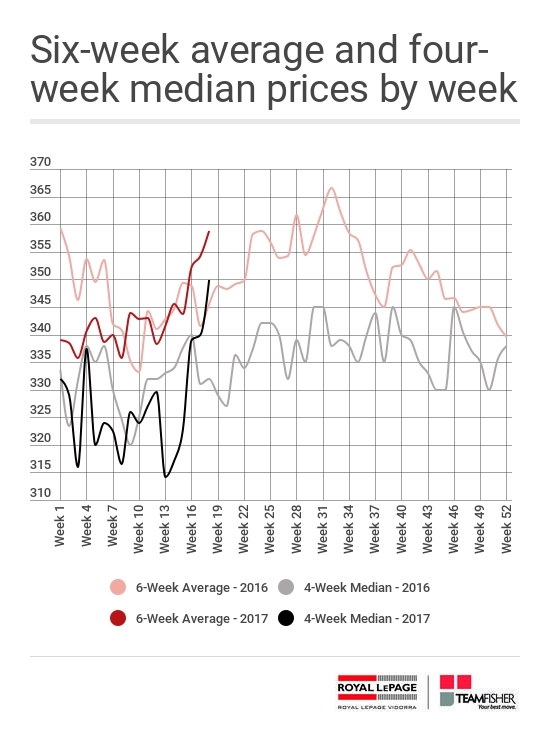 After climbing steadily for six consecutive weeks, the four-week median price fell lower by $4,500 from a week earlier to settle at $348,000 for an annual gain of twenty-one thousand dollars. Interestingly, our price measures are out of sync with MLS® Home Price Index data which shows Saskatoon single-family homes having dropped by 2.63% from a year ago. According to the same index, apartment prices are lower by 1.45%, and townhomes down 4.44%. Overbid activity fell flat as just one seller found a buyer willing to bid up their price. They picked up an extra $2100 in closing their deal. Another six managed to complete a sale at their asking price. The remaining 92 sales required some give and take which netted this week’s buyers an average discount of $11,764. Coming off of a soft April which saw residential sales slip nearly 17 percent from the same month last year, the month of May is showing promising signs of making up some of that shortfall as sales have shown modest year-over-year gains for the second consecutive week. 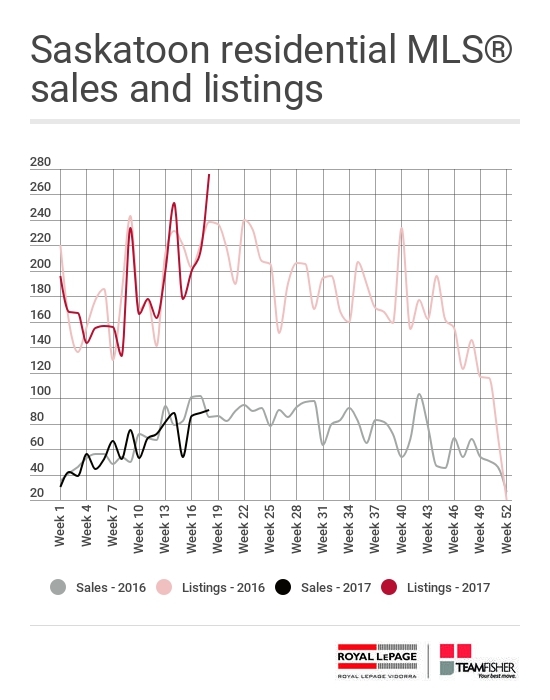 Saskatoon real estate agents reported 90 firm home sales this past week, down one from the week before, and four ahead of numbers posted during the same period last year. After posting serious annual gains last week, the number of Saskatoon homes added to the multiple listing service® fell lower this week by 52 properties to 224. That’s down 13 units from the same week of 2016. The inventory of Saskatoon homes for sale on the MLS® continued to move higher and added 63 units to its numbers by the close of business Friday. Today’s final numbers come in at 2115, up by 46 from a year earlier. A closer look at the major housing categories shows that buyers have a selection of 1146 single-family homes, up from 1117 at the time last year. Condominium inventory sits at 808 for an annual increase of 31 units. Average and median prices continue to move higher buoyed by very strong activity at the market’s upper end. With more than a third of this week’s sales surpassing the $400,000 mark, the weekly median price moved up twenty-six thousand dollars to $370,000 and reached its highest point this year. Two sales that contributed over $2 million to the week’s dollar volume drove the weekly average price to $365,635 for a seven-day gain of nearly 15K. The six-week average price inched higher growing by about a thousand dollars from last week to settle at $359,834. That marks its fourth consecutive upward move to put it ahead of where its stood at this time last year by roughly 10K. Meanwhile, the four-week median price grew by twenty-six hundred dollars to $352,500. That’s also a new high for the year. It’s up twenty-three thousand dollars from a year earlier. It’s worth noting that these gains are somewhat out of sync with the Canadian Real Estate Association’s MLS® Home Price Index, which, at the close of April showed a 2.6 percent year-over-year decline in its “Composite Index”. There was some strong overbid activity with five lucky sellers bagging an offer above their asking price. Those overbids paid an average bonus of $6,480 but most of those wins went to one seller who picked up a $30,000 surprise after the dust settled. Another 75 sellers gave up some dough and agreed to a discount averaging $16,739 but one listing that went $300,000 below list skewed that number a fair bit, particularly in area 2 which recorded an average underbid of more than twenty-seven thousand dollars. The ten remaining sales were reported to have sold for asking price. 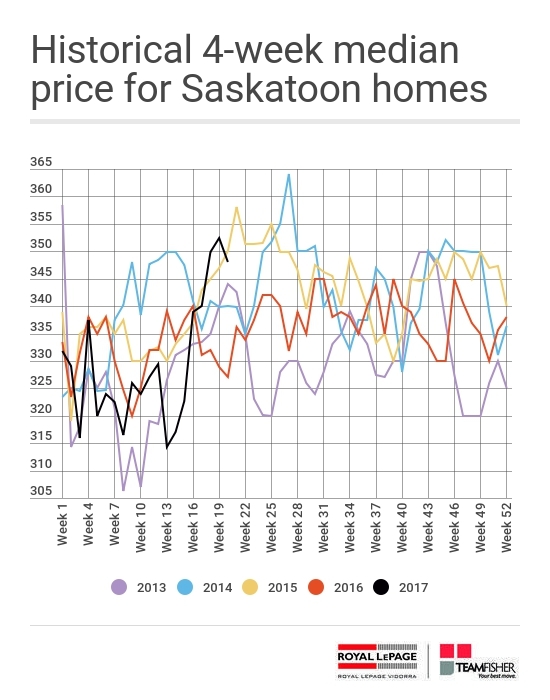 The Saskatoon real estate market continued to heat up in lockstep with the weather as local agents reported brisk activity in both sales and new listings. A total of 91 firm deals were reported to the MLS® over the past week, up from 88 a week earlier, and topping sales for the same week last year by six. New listing activity was particularly strong as the flood of month-end expired listings re-entered the system. This week, 276 residential listings were processed, the largest number for any week this year. That topped last week by almost 60 units and grew by 38 when compared with the same week last year. Active MLS® listings in the residential category increased to 2052, up 33 from the week before. Last year at this time there were 1992 Saskatoon homes for sale on the multiple listing service®. At the close of business this week, buyers had a selection of 1106 single-family homes to choose from, up from 1079 a year ago. Condo inventory fell by just a couple of units from a week earlier and settled at 785 for an annual increase of 39 units. 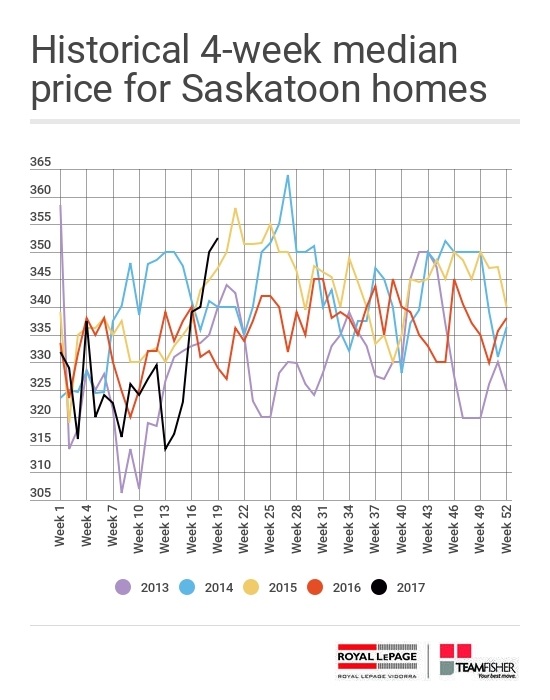 The weekly average price of a Saskatoon home slipped lower from a week earlier. It closed the week at $349,891 for a weekly drop of four thousand dollars, even as higher end activity caused the weekly median price to spike nearly 20K to reach $344,000. Meanwhile, the six-week average price headed upwards taking a forty-five hundred dollar weekly increase to reach $358,848 for a new annual high. It’s actually at its highest point in five years, for this particular week on the calendar and ahead of last year by more than thirteen thousand dollars. The four-week median price followed a similar path taking a weekly increase of almost 10K. That brought it to $349,900 for an annual increase of nearly $18,000. Only one lucky seller found a buyer willing to pay more than list price, that one going over by just $100. Another 11 Saskatoon homes traded at the listed price while 79 others went for less than the asking price by an average of $12,302.